In 2016 Albania launched a comprehensive justice reform process to tackle the shortcomings in the justice system, as well as to improve and bring into line the existing legislation on juvenile justice with international standards. In 2017 the Juvenile Justice Code was approved and came into effect on January 1st 2018. A key component of the new code is the introduction of restorative approaches to juvenile offenders which will be innovative within the Albanian context. This initiative provides a timely opportunity to address restorative justice and build restorative practices as the new code is being implemented. In this framework, Terre des hommes Mission in Albania, in partnership with Terre des hommes Foundation in Hungary and the Foundation for Conflict Resolution and Reconciliation of Disputes, with the support of the Delegation of the European Union to Albania, has started a new EU-funded initiative under the European Instrument for Democracy and Human Rights (EIDHR) on contributing to the respect of children rights of children/youth in contact with the law through advancing the implementation of restorative approaches & prevention of imprisonment according to the new juvenile justice code in Albania. 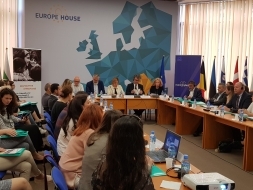 The initiative was launched in a roundtable on May 8th, 2018 at the premises of the Europe House with the purpose of creating awareness on restorative approaches among key stakeholders, justice professionals, policy makers, practitioners and civil society and serve as a platform to exchange knowledge and information on alternatives for young people in conflict with the law. This event was greeted by Mrs. Vasilika Hysi – Vice Chair of the Albanian Parliament, Mr. Toni Gogu, the Vice Minister of Justice and Mr. Stephen Stork, Head of the EU Delegation - Operation Section 1 who shared their valuable opinions and recommendations towards juvenile justice system development.